Tesla has delayed released of their Model X luxury crossover until the third quarter of 2015 so that the company can focus on overseas rollouts of their Model S sedan. Based on what is known now, the starting price of the vehicle is expected to be approximately $70,000 when the auto does hit the market. The SUV is 100% electric, and will see approximately a 95 mpg (equivalent) from the 60 kWh battery option with the auto that will have a rated 230 mile range. There will also be an 80 kWh battery that consumers can upgrade to that will have a 300 mile range in between full charges. There will also be an all-wheel drive option making the Model X the first all-electric car to have this feature. 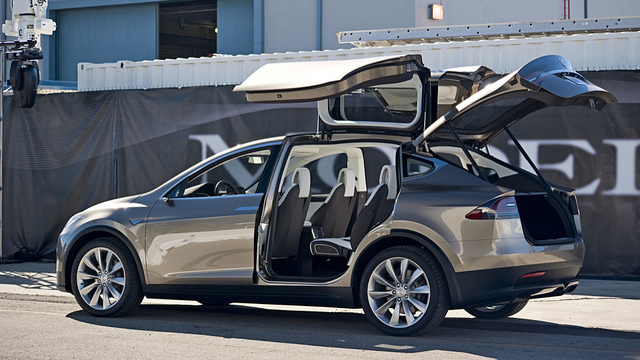 Combined with a 17 inch touchscreen center console and falcon-wing doors which lift up, and the seven passenger seats, the Model X with the all-wheel option is looking to make a splash in the crossover market soon.